I finally finished up all my holiday baking on Christmas Eve. I needed one more yummy chocolaty treat to finish off my cookie trays. 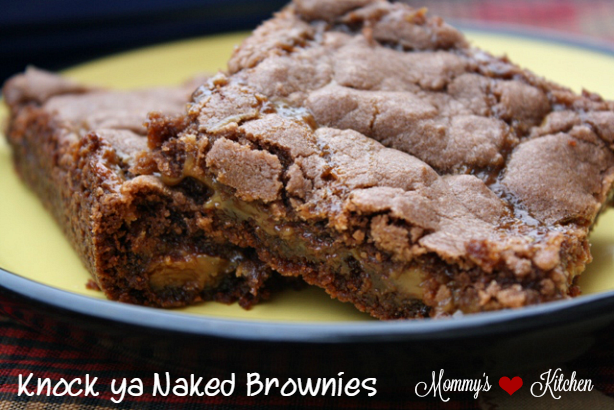 I have to say I could not of picked a better treat than these Knock You Naked Brownies. This recipe has been filed away in my recipe file ever since my daughter was a baby (10 years). I initially got this recipe from a friend at an online forum, but I recently read that this recipe originated at the Salt Creek Restaurant & Steakhouse in Breckenridge, Colorado. What is a Knock You Naked Brownie you ask? Well, it's a chocolate brownie filled with chocolate chips, nuts an a gooey caramel layer in the center. It's been said that these brownies are so tasty that they just might knock your clothes off. 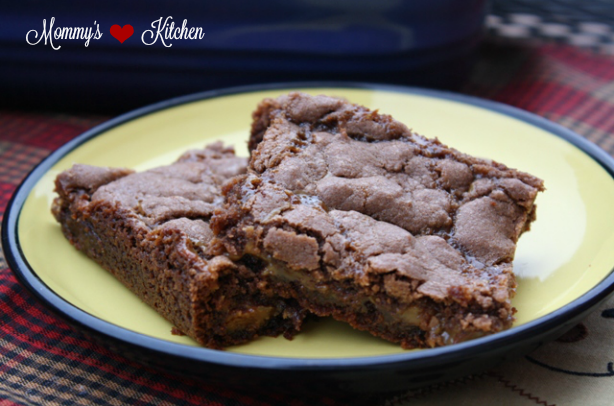 This recipes calls for a German chocolate cake mix which is always a plus in my book. I love using cake mixes to create so many different desserts. The recipe was easy to toss together and only required a handful of ingredients. These chocolaty brownies bake up perfectly with yummy little pockets of caramel throughout. I can honestly say these brownies are so good they could knock your clothes off!!!! We took a bunch over to a friends house and my friends husband ate all of them. The kids kept asking about the about name of these brownies all night. I really think they thought these brownies were gonna knock their clothes off LOL! These brownies are the perfect treat if you want to impress someone. This is my go to treat when I have a party, get together or cookout. The only thing I bring home is an empty tray. Preheat oven to 350 degrees. In a large mixing bowl, combine dry cake mix, nuts, 1/3 cup evaporated milk and melted butter. Press half of the batter into the bottom of a greased 9x9 inch baking dish.Bake in the oven for eight minutes and then remove. While the first brownie layer is baking prepare the caramel mixture. You can do this in the microwave or by using a double boiler melt caramels with remaining 1/2 cup evaporated milk. When caramel mixture is well mixed and melted, pour over baked layer. Cover with chocolate chips. Chill for about 30 minutes or until the caramel is set. I did not do that part because I was afraid of the temperature change with my baking dish. So I just let the Brownies sit on the counter for about 30 minutes and then added the second layer. Using the remaining batter drop by spoon fulls all over the caramel mixture. Don't worry about covering all the caramel mixture because the batter will bake up over the gooey mixture. You can also place the dough between 2 sheets of waxed paper and roll it into a square. Then place the layer over the caramel mixture. Return to oven and bake an additional 20 - 25 minutes (or less for gooier brownies). Let cool before cutting. Cook's Note & Disclaimer: This recipe was not taken from The Pioneer Woman and posted as my own. I posted this recipe in 2010 a year before she published the recipe on her site in 2011. So please do not leave a comment stating I'm stealing, because it will just be deleted. I feel this needs to be clarified as I DO NOT steal or scrape recipes, and re post them as my own. I always give proper recipe credit. This recipe is actually an adapted version from The Original Salt Creek Steakhouse & Restaurant, and a vintage 1970's recipe that goes by the name Marvie Bars. These sound & look soooo good! I just printed this one out so I can make them after our holiday goodies are gone. Thanks for sharing the recipe! Thanks Tina! I've got to make these!! Looks so yummy!!!! Hope you and your family had a blessed Christmas!!! Oh my! These sound super delish! My son's 2nd birthday party is next weekend, and I think we will most definitely be making a batch of these! Ahh those sound good! 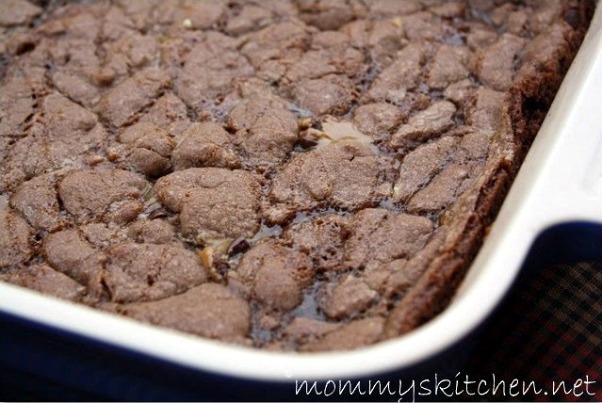 Gooey carmel and chocolate brownies? Hello! My goodness these look good! Adding it to my "Try It" list. Your picture looks good enough to bite into - if I could! I have a similar recipe in my cookbook - bought the ingredients to make them for the holidays, then ended up using the caramels for something else. WAAAHHH!!! These look awesome! Must try the brownies but have to go buy some caramels. I wonder if this would work with a regular chocolate cake mix? Maybe way too rich? LOL- can any chocolate be too rich? Thank you so much for sharing this recipe! These look out of this world good! Wowsers!!! - Hello there yummy brownies indeed! I look forward to making this recipe as soon as my house empties from all the other sweets and treats we have here. I decided to share something a little bit healthier this week- Cauliflower "Potato" Salad. It tastes really close to traditional potato salad but without all of the carbos! Happy New and prosperous year.I made Chocolate cake this time without sugar ,it was very nice and better than the sugar cake.Healthier for sugar free people. I just made these for New Year's Eve after seeing them on your blog. They are really good! I just posted them on my blog. Thanks. My wife would love these as she loves brownies. I wondering can I substitute German chocolate cake mix for chocolate cake? The recipe calls for a german chocolate cake mix and not chocolate. These are soooo good. I used a chocolate fudge cake make that I had on hand and they were heavenly! Oh my Goodness! Sound and look mouth-watering. I'm such a big fan of caramel AND chocolate..what's not to love? Thanks for sharing at Weekend Potluck. Yep, I've made these since my kids were still home, back in the 1990's, so you sure didn't steal this! This has been my go to Christmas cookie recipe forever. They are so good!. Everyone requests me to make them every year. I got the recipe from my Great Recipes From True Story cook book back in 1978. (it's on page 78 in the book) It's called Carmel Layer Chocolate Squares. I still have the paperback cookbook after all these years even though the pages are brown and a little brittle now. LOL! I saw the picture and was keen to make these, but I've never heard of German chocolate cake mix. I live in Australia, perhaps our supermarkets don't stock it. They look lovely anyway! I first tried these in about 1974 or 1975 and have been making them ever since!! I'm going to make this to take to my son's house next week. I know my grandchildren will love it! Thank you too for the awesome print application you use! What a treat to be able to delete what you don't need before you print - saves paper! Thank you! Hmmm..not sure what happened to my original comment, but I'll try again. No eggs required? Most cake and brownie recipes call for at least one egg. There is no eggs in this recipe. Recipes are not proprietary, only some names are. Looks great! Making these right now for our New year's Eve party tonight!